The perfect office for any job site. 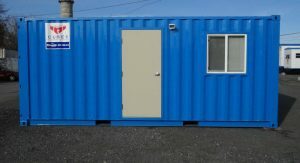 These containers are fully equipped with heat, air conditioning, outlets and a full electric panel. This is the most simple way to take your office with you anywhere! This 20′ office container features an open floor plan with a small storage closet. This space is equipped with heat, air conditioning, a full electric panel, and ample lighting. Custom paint, flooring and floor plans are available. Check out out Accessories page to see the many ways you can make this space just right for you. Looking for a larger office? Larger storage space? Let us know! 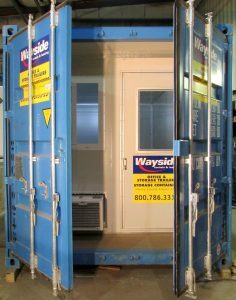 We built these office containers right here in our shop which means we can build exactly what your looking for. NEW! We also offer removable Office Kits. What is a removable Office Kit? These kits can be added to any 20′ container to transform it into a fully functioning office in just a few hours! These kits are available for both purchase and rent. 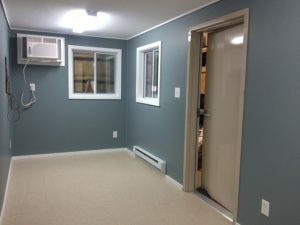 The barn doors can be closed completely and locked shut to protect your office valuables or relocate to your next job. Visit our accessories page to read more and see the other container accessories we offer.